The finished set should be used and enjoyed. Periodic use will keep the set in good order, and dry out any damp. The electrolytic capacitors also benefit from regular use, as it avoids the need for further reforming. I would suggest that the set should be played for at least one hour every month or so. One hour or more allows the set to warm up properly, which is better for the valves than brief periods of operation. It is not a good idea to use the switch combined with a potentiometer as this wears the track. However, we should all use our radios! If, as I do, you have a number of sets plugged into an unswitched socket strip. B&Q sell 13A plugs with an integral switch and neon. I wouldn't trust these at 13A, but they are fine for a radio. Fit a 1A HRC 1" fuse to the plug (available Farnell), it could save you a mains transformer. One of the problems with having restored radios is the general lack of decent radio programmes for it to play. Many sets only have MW and LW wavebands, whereas a lot of the stations we want to listen to are on VHF only. On sets that do have VHF, this waveband often only goes up to 100MHz. It may be possible to tweak the alignment a bit to bring in Classic FM which broadcasts between 100 and 102 MHz, at the expense of scale accuracy. If the programme material you want your set to play is not available within the wavebands it can receive, you have a couple of options. If the set had a Gram input you could connect a programme source (transistor radio, CD player or whatever) to this. It works OK, but to my mind it's cheating a bit. Most of the set which you carefully restored isn't actually doing anything - you are just using the amplifier and power supply. A better option is to use a small modulator unit to retransmit the programme material at low power on MW. Several units intended for this purpose are reviewed on this website. The range of these units is such that with a loop aerial it is only receivable within the same building, so no interference would be caused to neighbours etc. Alternatively the unit can alternatively be connected directly to the aerial socket on your radio, however care must be taken to ensure this arrangement is safe. As mentioned above, the range of period music broadcast nowadays is limited. BBC Radio 2 used to have a few programmes of interest but now they seem to be trying to reinvent themselves to sound like Radio 1 of fifteen years ago and most of this is being quietly dropped. Desmond Carrington plays a certain amount of period music on his Monday evening show, but even this seems to be slowly going the way of the rest of the stations output. Some collectors enjoy Classic FM, but this is not my choice. Perhaps someone who listens to this station could recommend some good programmes or times to listen? If you live in (or around) the West Midlands area, Saga 105.7 FM may well be of interest. The station, like everything Saga do, is aimed at the over 50s, and plays a good selection of music from the 1940s up to the present day. The presentation is pleasant and not rushed. In some ways it is quite reminiscent of the programming on Radio 2 around ten years ago. Unfortunately the frequency is too high for the VHF band on most vintage radios (which only go up to 100MHz or 104MHz) so you will need to use a modulator to rebroadcast it. If you are within reception range I can highly recommend Saga. I can receive it in Hereford with a basic outdoor aerial, and it is also receivable on-and-off in the car down as far as Gloucester. They have a number of listeners in Cheltenham, judging from the requests read out sometimes. An East Midlands service on 106.6MHz FM and Glasgow service on 105.2MHz are also available offering similar programming to the West Midlands one, and Saga are continuing to apply for licenses in other areas (Manchester and Solent currently). If you are outside the reception range of the FM services, Saga broadcast a similar (but with a bit less character) station called Prime Time Radio on Sky Digital Channel 882 and also on DAB. There are a number of companies selling good quality copies of music from the 1930s to the 1950s on CD and cassette. Past Perfect have a good reputation, and although I do not yet own any of their recordings, I have always been impressed with the quality of tracks from them played by Desmond Carrington on Radio 2. HMV have launched a range of "HMV Easy" CDs, produced by EMI and containing music from their back-catalogue. They are sold exclusively in HMV stores and on the HMV website (type "hmv easy" in the search box and set the search method to "keywords"). We have purchased one of these CDs (a Christmas compilation) and found that although the quality is very good, the mix of tracks was was not quite what we would class as easy listening. Fortunately HMV operate a no-quibbles 28 day return policy. 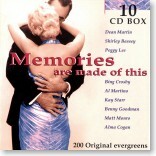 There are a number of budget labels producing CDs containing tracks by artists of the 1940s onwards. A lot of these are sold in places like Poundstretcher and Catalogue Bargain Store as well as the more obvious outlets. If you have digital television, watch the music hours on some of the shopping channels. These often offer sets of between four and ten CDs for between £20 and £40, and some of these contain a good selection of music that may be of interest. I have one such boxed set of 10 CDs called "Memories are made of this" published by Disky. It contains 200 original recordings from the 40s and 50s, and can highly recommend it. Although I actually bought it for a couple of pounds at a car boot sale, it is exactly the sort of compilation that these channels sell for about £30 (indeed the "Ideal World" channel have music hours sponsored by this record company). An important point to check, particularly with the budget labels, is whether the tracks are "re-recorded". What we really want are the original recordings, but to get around copyright a lot of the budget labels get the artists to record the songs again for the CD. More often than not, the re-recordings are not particularly good. If tracks are re-recorded this is generally, but not always, stated in small print on the back of the CD case. Another ploy is to use live recordings. If you are purchasing CDs online or from television shopping channels, you should check what sort of returns policy is offered, in case the CD does not meet your expectations. HMV will happily accept CDs ordered via the website back for refund within 28 days for any reason (even if you just don't like it), whereas many other online stores (such as Amazon) only accept CDs back if they are faulty. It is worth paying the slightly higher price that HMV charge for the assurance that you won't be stuck with something you don't like. Most of the television shopping channels also offer flexible returns policies. Also check the postage and packing charges before ordering - the companies with the cheaper prices often have the highest P&P charges to compensate.